Paul and Ros welcome you to their modern luxury cattery. Situated in the village of Eldwick, 2 miles from Bingley and Baildon, Within easy access of Ilkley, Crossflatts, East Morton, Menston, Keighley, Guiseley, Shipley, Saltaire and surrounding areas. Welcome to The Springs Cattery in Eldwick. Located in secure and quiet surroundings with individually heated bedroom areas. 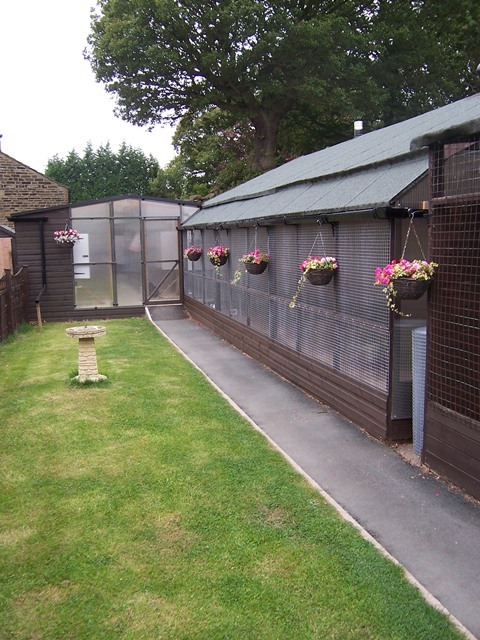 The Springs Cattery is a delightful place for your cats to stay at any time for short or longer stays. We pride ourselves on offering a friendly, family run business providing for the security and well being of your cats, and peace of mind for you. We have a resident nurse to administer medication and injections. Our opening hours, for drop off and collection, are 9:00am - 11:00am and 4:00pm - 6:00pm every day. Please note we are open 9am to 11am on Christmas Eve and New Year's Eve, and closed for drop off and pick up on Christmas Day, Boxing Day and New Years Day. Please feel free to ring if you wish to book, have any questions or would like to look around. If we do not answer your call straight away it's just because we are busy caring for our lovely guests. If you leave a message we will get back to you as soon as we can. We also have adapted accommodation for cats with reduced mobility. * 24 hour or less boarding will incur an additional short stay charge. Please ask for details. Christmas Day and New Year's Day will incur a 1 day supplement if boarding is 6 days or less. We have an extensive range of cat foods to suit your pets dietary requirements. You are also welcome to bring your cat's own familiar food. * 24 hour or less boarding will incur an additional short stay charge. Please ask for details. In the interests of all our guests, cats and dogs must have up to date vaccinations, including kennel cough for dogs. The only thing you need to bring (besides your pet!) is their vaccination card. We can provide for everything else as required. Thank you for visiting our website, if you need any further information please feel free to contact us.